Looking for the Samsung Galaxy Note9? With all the clever features of the Note8, you won’t want to put it down. So you’ll be pleased to know the 3300mAh battery is big enough to keep up with you. And with fast charging, even if you do need a top up, you’ll be back up and running in no time. Take notes. Draw pictures. Make lists. Write over things. Scribble on the screen even when your phone's asleep. There's not much you can't do, with the super smart S Pen. Like to do a few bits at once? The Samsung Galaxy Note8 has a split screen mode, so you can have more than one app open at a time. You can even add two apps to one shortcut, to get to the things you use the most, quicker. And with plenty of screen at your fingertips, it's even easier to get stuff done. 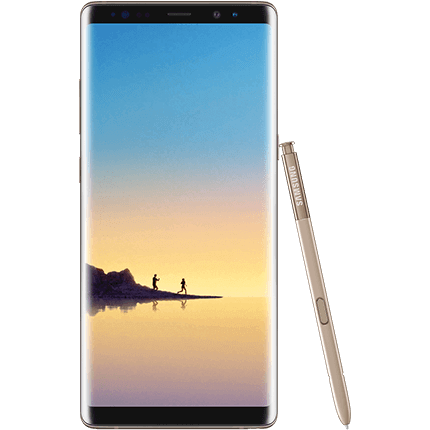 The Galaxy Note8 uses iris recognition, for added security. So you can keep your private things private. And be safe in the knowledge that any sensitive content won’t fall into the wrong hands.